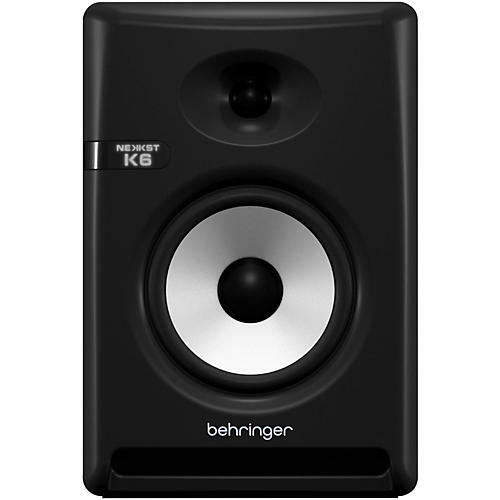 The 150W NEKKST K6 Studio Monitor' world-class performance is the result of a major collaboration between BEHRINGER audio engineers and loudspeaker master-designer/founder of KRK “ Keith R. Klawitter. This incredible reference system is ideal for all critical listening environments thanks to the custom-engineered bi-amplification system that features separate amplifiers for the 6" glass-fiber woofer and 1" silk-dome tweeter. K6' long-throw woofer generates deep, tight bass and virtually smear-proof mids, while the ultra-high resolution tweeter provides sparkling highs “ all enhanced by Keith' Advanced Waveguide Technology for an extremely generous sweet spot. The goal of a great studio monitor is to present an accurate representation of your mix, so you can tell how well it will translate to the diverse listening environments and systems of today, such as car stereos, club sound systems, radio, portable digital music players and others. The remarkably-flat response of the NEKKST K6 allows you to work with the complete confidence that your mixes will œplay accurately on these systems and to your audience at large. The ultra-linear, 150W reference-class NEKKST K6 was designed by renowned acoustic icon and founder of KRK, Keith R. Klawitter “ a man who has devoted much of his life to the quest for the "perfect" loudspeaker. The K6 features Keith's advanced Waveguide technology for the ultimate in acoustic dispersion, which generates an extremely large œsweet zone for easy and optimal monitoring. A true bi-amped system, an ingenious crossover design and separate amplifiers are utilized for high and low-frequency signals, providing superb sound reproduction from the long-throw, deformation-resistant, glass-fiber cone woofer and pristinely-accurate, silk-dome tweeter. The NEKKST K6 not only satisfies seasoned engineers and producers, but makes audiophile-level sound accessible to both home and professional recording studio applications. The ability for a studio monitor to adapt to a wide range of acoustic conditions is of paramount importance, and the NEKKST K6 delivers extreme versatility in this arena. K6' rear panel features switches for adjusting high and low-frequency response, compensating for varying room attributes, or for pairing with a dedicated subwoofer. Independently-controlled limiters protect both the woofer and tweeter against overload. Since a monitor' output is only as good as its input, the NEKKST K6 includes a servo-balanced front end and accepts XLR, TRS and unbalanced RCA connectors for extremely-flexible connectivity. The high-density composite enclosure guarantees ultra-low diffraction and reduced low-frequency distortion. The audiophile-grade NEKKST K6 is the ideal tool for crafting mixes that translate perfectly across the widest possible spectrum of audio playback devices. Thanks to Keith Klawitter's custom-engineered bi-amp system driving an Advanced Waveguide-mounted 6.5" glass-fiber woofer and 1" silk-dome tweeter, you get deep, tight bass with virtually smear-proof mids and sparkling highs “ all in an extremely generous sweet spot! With the K6's comprehensive suite of options and features, this audiophile-grade monitor delivers, no matter what your listening environment.